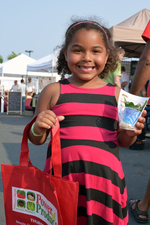 The 13th annual Maple Grove Farmers Market will open for the 2016 season from 3-7 p.m. Thursday, June 9 at the Maple Grove Community Center. It is anticipated more than 40 vendors will be at the market on opening day, offering a variety of locally grown and made food items. The market continues each Thursday after opening day ending Oct. 20. The free PoP Club provides children, ages 4-12, with $2 each week to spend on fresh fruits and vegetables at the market. “Parents tell us that their kids are much more interested and motivated to try new fruits and veggies,” Bansen Weigle said. Local sponsors Oakdale ObGyn, South Lake Pediatrics, and TopLine Federal Credit Union are supporters of the program for the 2016 season, according to Bansen Weigle. Products available include, but are not limited to, eggs, pork, beef, chicken, honey, maple syrup, locally grown produce and plant starts, sunflower oil, and canned goods. Artisan breads, specialty sauces and salsas, pierogis, and many more specialty food items round out the market’s offerings. Food trucks will offer ready-to-eat items, including crepes, grilled pork chops, grilled cheese, soup, and ice cream. Vendors accept cash. Credit, debit, and EBT cards may be used to purchase market tokens which are accepted throughout the market. From 4-7 p.m., live acoustic cello and guitar music featuring Glen Helgeson. Stop by the Market Information Booth for a Frequent Shopper card and earn rewards all season long as part of the customer loyalty rewards program.